1) While Native Americans had roamed the area for hundreds of years, the first European settlers came in the 18th Century and were from _________. 2) Dearborn is named for ________. 3) Who was born on June 30, 1863 on a farm in Greenfield Township, an area that today is part of Dearborn? This is just a sampling of some of the questions that might be thrown out this Saturday, March 28th. The Dearborn Historical Museum’s first trivia night will begin at 7 p.m. Bring your own team of 4 or come by yourself and we will put you on a team. 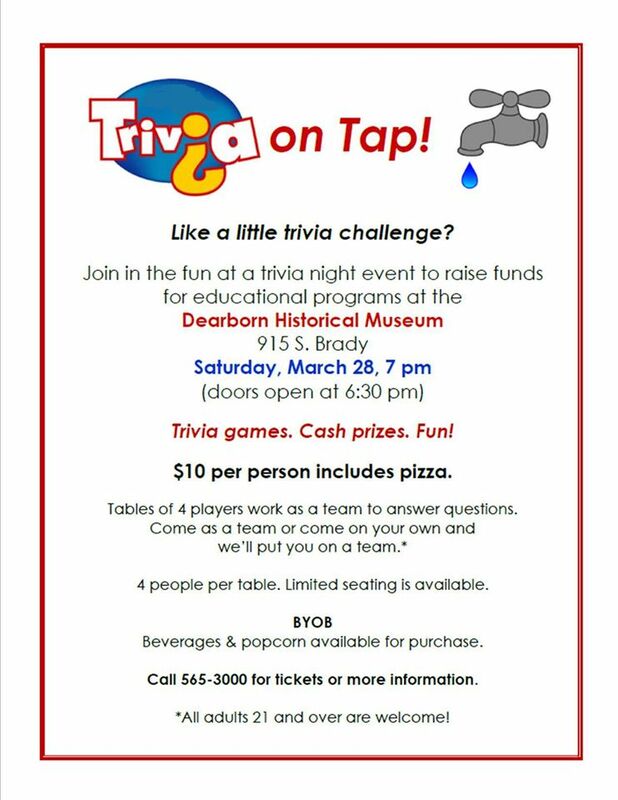 It is only $10 to participate and all money raised will be used for the educational programming of the Museum. We want to make this a fun evening for all involved and you may learn some facts that you never knew before. Please consider supporting the heritage of your area. Below is more information on what we are sure will be a great evening. Please call the Museum today to purchase your tickets. Thank you for supporting local history programming.